" Through this program, we want the children to have ideals and basic foundations to pay attention to health problems in the future"
The Kebayoran Baru RSUD, South Jakarta is launching five information and technology-based services (IT) and kids hospital tour programs to improve public health services. 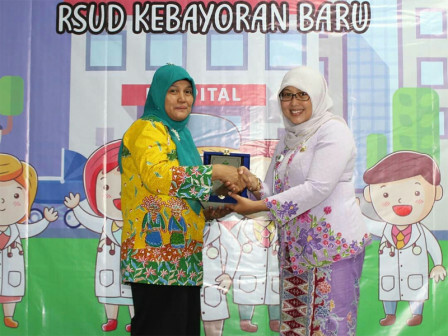 Kebayoran Baru RSUD Director, Friana Asmely said that kids hospital tour is a program that serves to provide education about health from an early age and provide an introduction to the profession in the hospital. "Through this program, we want the children to have ideals and basic foundations to pay attention to health problems in the future," he expressed, Friday (8/31). Those five information and technology-based services are www.rsudkebayoranbaru.jakarta.go.id, e-SKM, Sistem Rujukan Balik (SIROJALIK), SIDUKUN 3 in 1, and PEMIO application (medication reminder). "It is aimed to improve public health services in the capital, especially in Kebayoran Baru," he told. Se explained that www.rsudkebayoranbaru.jakarta.go.id site is a way of introduction through a digital system that is mandatory to get closer to the public. Thus, the public can easily obtain health information at Kebayoran Baru RSUD. Further, e-SKM is a product innovation digital-based community satisfaction survey. It is to meet the convenience of public services such as the hope of the Ministry of Administrative and Bureaucratic Reform that ha d visited some time ago. SIROJALIK is an integrated system standard owned by Jakarta Health Dept. for faster and more accurate services. "For SIDUKUN 3 in 1 program, is a program of Jakarta Population and Civil Registration Dept. to make it easier for newborns to get self-identity faster and integrated," she added. Then PEMIO is an application to make it easier for patients to be able to take the medication in a timely manner. "This is launched to coincide with one year of Kebayoran Baru RSUD. We have served with the heart to the end," she uttered.